Yadah is ready to add on new addition to Yadah Family in this December 2013. Guess what?! 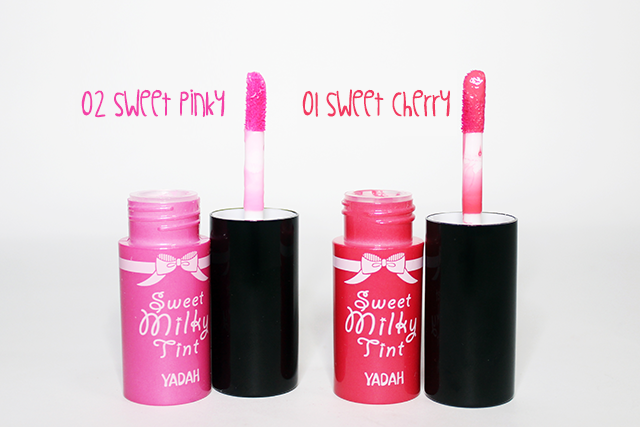 This time I would like to introducting you two new lips product into their series category namely Yadah Sweet Milky Tint in No.01 Sweet Cherry and No.2 Sweet Pink that suits for lips and cheeks. These product will be starting on sell starting this December 2013 at selected Sasa stores, Zalora.com.my, Hermo.my and MIVVA.com. 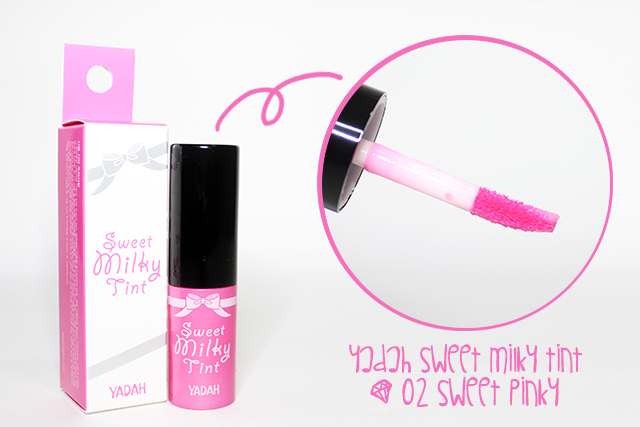 Yadah Sweet Milky Tint is a delicious milky in color tint lips product that gives your lips and cheeks a natural touch of color without stain and fade on foods or things. Beside that, Sweet Milky Tint is food and sweat proof test. Sweet Milky Tint is small and petite in bottle. Because of size, it really convenient and travel-friendly with a sponge tip applicator that provides easy and even blending. Sweet Milky Tint is literally a true gem in a bottle. It is unique formulated with semi-precious gemstones such as Amethyst, Pearl, Tourmaline, Emerald and Ruby which act as a barrier on the surface of lips to prevent water loss keeping lips moisturised in subtle sheer finish. Other than that, Sweet Milky Tint also enriched with fruit and flower extracts such as Common Purslane, White Mulberry, Pomegranate, Gingko Nuts and Common Fig which act natural conditioners with colour pigments extracted from Tomato and Gromwell. The texture is smooth, lightweight and non-sticky when applying. It does has light flavor of scent. It really easy to blend and makes layering. Talking about pigmentation, it gives a light and natural color of pigmentation with a quite lasting stain effect (around 5 to 6 hours without eating or less). The more layers you apply, the more vibrant of color pigmentation. #01 Sweet Cherry gives a natural fuchsia pink kind of lips color while #02 Sweet Pinky gives a really natural light sweet pink of lips colors. #02 Sweet Pinky also giving a of kind of healthy feeling like a natural lips.